Tuesday’s impending launch of Halo Reach is occupying most of the idle cycles of my brain. I’ve been watching gameplay videos, reading the recently unembargoed reviews, and in general, looking forward to not getting much else done this week. Much has been written about how this is Bungie’s last Halo outing and therefore, may be that last good Halo game (who knows what Microsoft is going to do to it). I enjoyed the public beta quite a bit, even though it was over so quickly. Every new video has gotten me more and more excited to play through campaign one more time, and then to join the multiplayer fray. I must admit, I was a little skeptical when Reach was announced and then turned out to be more of the same (and not the MMOFPS I was hoping for). But here I am, ready for one more installment of a game I’ve been watching for over 10 years. Halo and I have a complicated history. As a young Mac fanboy, I missed out on many PC shooters in their prime, like Doom, Quake, etc. I had to wait for ports, by which time the magic had sort of passed. Instead, I played Pathways into Darkness and Marathon and was generally a huge Bungie supporter. One of my most memorable gaming sessions was at the computer lab when I was visiting my brother at school. He and a bunch of his friends who worked in the lab had an epic Marathon night while Aliens played on the projector. Sensory overload. I loved all the little details about Marathon such as how you could see what weapon the other people were carrying, unlike Quake, and how you could muck with the physics engine to create guns that shot flies at your enemies. When Bungie announced Halo at Macworld in 1999, it was like getting a gift from on high. They planned to have a persistent multiplayer world. One of the devs said something to effect that if you fired a round, the shell casing would pop out and be on the ground in the same spot when you logged back on. Now I realize what a chore that would be to handle (to little effect), but as a fresh comp sci major, I was blown away by their ambition. A AAA multiplayer FPS title, developed and released first on the Mac. And so you can imagine the knife in this fanboy’s heart when Bungie was bought by Microsoft and Halo became an Xbox launch title. I actually resisted Halo 1 for a long time, partly due to this “betrayal.” My friend Adam got a launch Xbox in 2001, but we spent more time playing Dead or Alive than Halo. The few times I picked it up at his apartment, I would spend most of the time getting sniped in the head on Blood Gulch, or shotgunned in the back on Chiron (never could figure out the teleporters) or rocketed on Wizard. It wasn’t until I moved in with Adam in 2003 that I began to play in earnest. It was my second year out of school. I was living with Adam and another friend, Todd, in Adam’s condo. I lived more like a college student then than I did in college: I had tons of free time after work, and now I had disposable income. I got another Xbox for myself and we convinced another friend to shell out for one and leave it in the place and so we had nerdvana: 4 TVs, 4 Xboxes, a long lunch hour and several other video game junkies who were always ready for a fix. We would walk home during lunch, eat a quick sandwich while watching Sealab and then play a few games of Slayer. I started getting better at the game, especially on Hang em High, where I perfected the art of stealing kills at long range with the magnum, or getting cheap grenade bounces. 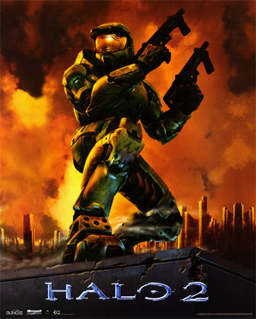 However, the main event was Nov 9th, 2004 when Halo 2 launched. We’d had a postcard of Master Chief dual wielding SMGs on the fridge for weeks (preorder bonuses from Gamestop). We even had one up at work and we schedule vacation for that day. Our plan: midnight pickup of the game, play it all the way through on coop until morning, then nap a bit. We grabbed energy drinks at the convenience store on the corner as well as Cheetos, Reese’s Peanut Butter cups and Kit Kats. And then… we executed. We played through the game on Heroic and managed to win around 9am. Passed out for a while, and then at lunch time, everyone else from the office came over to try out deathmatch. I probably would have enjoyed that more if my head hadn’t been trying to fall off my neck. After lunch, more napping and then back into the fray. I even went into the doghouse with my girlfriend at the time over November 9th: I’d jokingly told my friend Woods that I’d taken her to a nice restaurant the weekend before since I was going to be a bit more occupied after Halo 2 launched. He told his girlfriend, it got back to mine, and man, was I in trouble. But back to Halo: we ate, slept, and breathed Halo. Woods would even stay over once or twice a week on our ratty old futon (scavenged for free!). That futon was so uncomfortable that we put boards underneath the mattress so he wouldn’t feel the bars through the thin cushion. We’d wake up and he’d be perched on the coffee table with a controller in hand. Having matchmaking meant that even when our other players weren’t around, we could jump on anytime and find people to frag. And the new modes like assault and 1 base CTF became our favorite. Almost every map was awesome and iconic. Playing Lockout and learning the jump to the flag point from the top of the airlift. Crouch walking the bomb into Ascension while invisible. Driving the Warthog into the base on Burial Mounds. One night, we made friends with this guy because the other team was griefing us on Burial Mounds. They’d taken the bomb and jumped up the wall using a map glitch. Then they were trying to pot shot us. We just took vehicles and messed around for, no kidding, several hours. We weren’t going to be griefed. The other guy’s name was Kunfu Grip and we chatted with him about his work and stuff. We even took a break for food and when we came back, Kunfu was dying with laughter: he’d managed to kill one of the jumpers with the ghost: they’d just left their Xbox on as well and he managed to gradually whittle the guys health down. Bungie added stats tracking in Halo 2 so now we could experience Halo even while we were at work: we could check up on games from the night before and look at the medals and the K/D ratio. We hardly ever played ranked modes, we preferred to play social playlists because we didn’t have reliable 3rd and 4th players, and so we could never take down a fully integrated team. We’d sometimes get pissed when the hackers took over with aimbots and the like, but Bungie wielded the banhammer and we left feedback for users and made it a point of pride to make it through every game, no matter how painful. And then the map packs, like the one that added Terminal, which is still an insanely great assault or CTF map. I’ll always remember the first time I played Terminal, and heard the ambient sounds of the train announcer. Do you remember than indie Hope Davis romantic comedy Next Stop Wonderland? The trailer for that ends with that same sort of train announcer voice and I still link the two in my head. Next stop, plant-the-bomberland. I don’t know if I’ll ever play another game the way I played Halo 2. It’s so wrapped up in that fresh post-college portion of my life. No major responsibilities. Building autonomy. And not really sure where I was heading, professionally or personally. It was really easy to just get complacent and think that those days would last forever, that Bungie would keep adding maps and modes and we’d keep playing them. It was great being surrounded by other guys in the exact same stage of life. It couldn’t last: people started getting married, buying homes, and the like. Game time got harder and harder to carve out of our workday. Woods stopped sleeping over on our ratty futon. I moved out in 2005 and got my own place up the street. We’d still play online, but it took more planning. Time had to be allotted, whereas before, Halo just filled our empty spaces. Tomorrow: Halo 3 and ODST. For us, the game was Mario Kart 64. OMG, the battles were epic. We even used it to settle in-building disputes like with the guys downstairs who were too loud. I never got into MK64, but I played plenty of MK on the DS. We used to take MK breaks in the “break room” on the top floor of our office building. I quote it because it was this dank little room with a soda machine, a few dirty chairs, no windows. And yet: epic 4 player MK battles playing as R.O.B riding the Egg car. Good times (but still not Halo 2).